The late National Artist for Sculpture Napoleon V. Abueva was honored with a special tribute by Directories Philippines Corporation (DPC) and the Philippine Long Distance Telephone Company (PLDT) during the awarding ceremony of the DPC-PLDT Visual Arts Competition 32 (VAC 32) held at the Cultural Center of the Philippines recently. 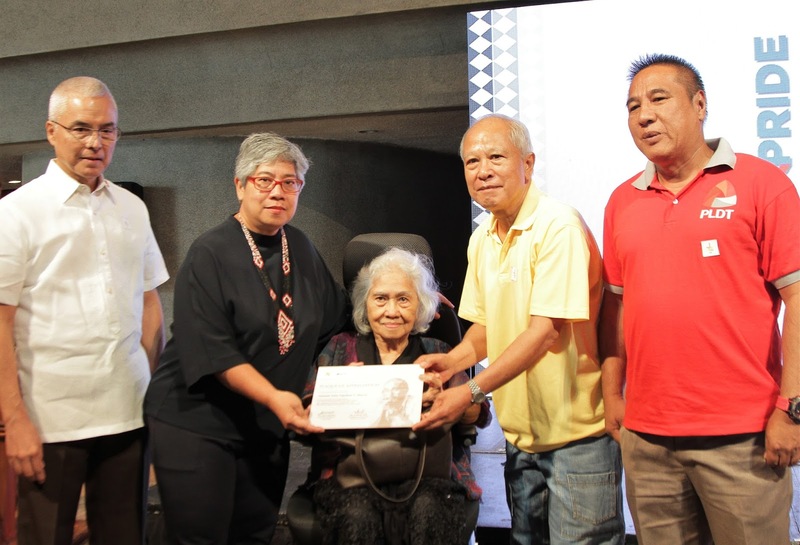 DPC and PLDT presented a special plaque of appreciation for the late national artist to Dr. Sergia Abueva, the National Artist’s widow and his daughter, Amihan Abueva. Dean Abueva, who passed away on February 16, 2018, helped establish the foundation for the VAC, along with deans of other Fine Arts schools in the Philippines. As part of the tribute, replicas of the original trophy designed by Dean Abueva in 1990 were given to the schools of the top three winners of VAC 32. Above, DPC Chief Operating Officer Arturo Diago (left), founding VAC Project Director Fred Amat, and long-time VAC Coordinator of PLDT Robert Sarte present the award to Dr. Sergia Abueva and Amihan Abueva. Fittingly, too, the unique ceramic trophies for each of the VAC 32 major prize winners had been designed by Lanelle Abueva-Fernando, niece of the late National Artist.